MainAll NewsForeign AffairsNetanyahu to Macron: Read the Bible - Jerusalem is our capital! Netanyahu to Macron: Read the Bible - Jerusalem is our capital! Netanyahu slams efforts to deny Jerusalem as Israel's capital, while French President Macron urges Israel to restrain settlement expansion. Israeli Prime Minister Binyamin Netanyahu met with French President Emmanuel Macron in Paris on Sunday, days after President Donald Trump declared that the United States recognized Jerusalem as Israel’s capital city, and announced that the State Department would begin the process of relocated the US embassy from Tel Aviv to Jerusalem. President Donald Trump made the historic announcement on Wednesday, drawing criticism from European allies and much of the Arab and Muslim world. Riots broke out following the announcement, peaking Friday afternoon. Prior to Trump’s announcement, French President Emmanuel Macron urged the American leader not to publicly recognize Jerusalem as the Israeli capital, pressing him in a phone call to preserve the status quo. On Sunday, Macron met with Netanyahu, one of the few world leaders to praise President Trump for his historic step in recognizing Israel’s capital. During the meeting, Macron pressed the Israeli premier to restrict the growth of Jewish communities in Judea and Samaria, and urging him to present goodwill gestures to the Palestinian Authority in a bid to reboot final status negotiations, which have been frozen since 2014. "It seems to me that freezing settlement building and confidence measures with regard to the Palestinian authority are important acts to start with, which we discussed with Prime Minister Netanyahu," Macron said. 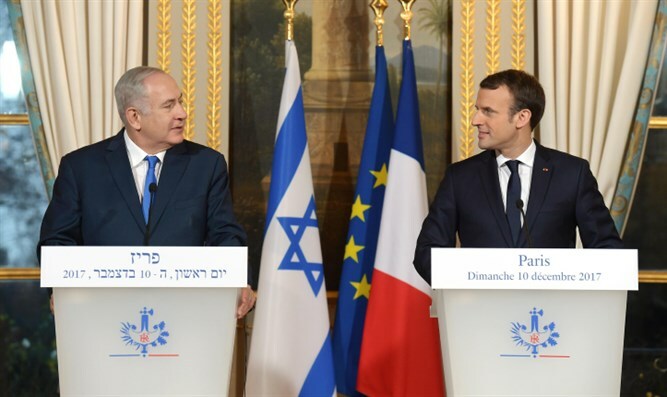 In a press conference with Netanyahu immediately after their meeting, Macron said he had implored Netanyahu to “show courage” in pursuing negotiations with the PA, despite anti-Israel incitement by the PA and recent attacks, including a stabbing attack in Jerusalem on Sunday. "I urged the prime minister to show courage in his dealings with the Palestinians to get us out of the current dead-end," Macron said. The French president also condemned "all the attacks in these last few hours and days", referencing the Jerusalem stabbing attack. "You can read it in a very fine book - it's called the Bible," Netanyahu said. "You can read it after the Bible. You can hear it in the history of Jewish communities throughout our diaspora – ‘Next year in Jerusalem’,” continued Netanyahu, referencing a phrase from the Passover Seder.